"We knew Jon was a perfect match from the very first time we met him. 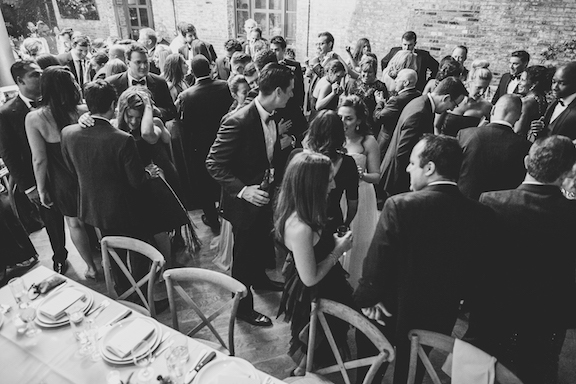 He listened to our requests and came up with a music list which perfectly suited our style." "If you're looking for an A-list DJ that really knows music, can read a crowd, and that will have everyone talking about how good the music was at your wedding... Love Junkies is it. Jon was truly a highlight of our wedding. He appealed to both older and younger crowds, peppered in some of our favorite artists, and really set the tone for an awesome party. Bottom line, Jon is excellent at both planning and execution. He's organized, reliable and creative. We are so grateful to him for all the work he did to make our wedding even better and more memorable than we'd imagined. Thank you Jon!!!" "Jon was an amazing DJ! He was professional, responsive, and brought up things we hadn't even thought of! He was on top of everything leading up to the event, including going direct with the venue to work out the space and set-up. And then the night of he was even better than we expected. Friends couldn't stop raving about how he kept the whole wedding on the dance floor the whole night! We still have people ask for his information. We couldn't recommend him more!" "I really cannot say enough good things about the experience Jon delivered on our wedding day. Not only did he curate an amazing playlist for every facet the event (cocktails, dinner, dancing, entry) but the transitions were all seamless, the sound quality and volume was excellent, and the timings were on point. It was very professional that Jon did not try to inject any extra flare (i.e. hype man) and just let his skills do all the work." "Jon is an incredibly talented DJ and we were so lucky he was available for our wedding day! He made the entire planning process so seamless and fun. Jon really paid attention to our musical likes and dislikes and made sure the songs played at our wedding were exactly what we had in mind. The music was exceptional! He really paid attention to the dance floor enthusiasm and catered to the vibe of the room when playing music. Our guests had a great time." "Jon was absolutely fantastic! He was very professional and really fun to work with. 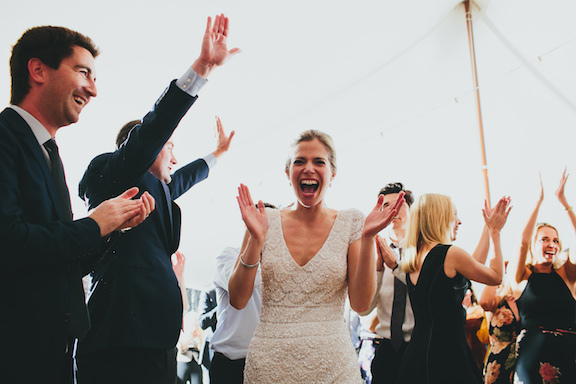 Andrew and I didn't have to worry on our wedding day and he really got the crowd dancing all night long!" "We couldn’t have asked for a better experience working with Jon. He listened to us, gave us useful/practical advice and was extremely responsive throughout the process. The dance floor was packed all night and compliments are still coming in about the music. He’s dynamic and did a great job of weaving different genres to keep all guests entertained as well as incorporating all of our must-play songs. A few other positives worth noting: -He’s actually mixing, cutting, etc. (been to a few weddings where DJ’s play songs start-to-finish and it is painful to watch) -He liaised directly with the venue leading up to the date so we didn’t have to be a middle man -His fee is fair and he is very transparent about everything he provides and needs (no surprises or last minute costs)." "Jon was super diligent about making sure we had all the right equipment for our outdoor DIY venue and everything went off without a hitch. He did a wonderful job of announcing speeches and the whole thing felt seamless. The music was perfect and had guests of all generations up and dancing all night. We had so much fun and he brought such great energy to the evening." "Worth every penny! The dance floor was packed all night and everyone LOVED the music. Jon was very responsive, organized, and professional - a dream to work with. We heard every song we wanted to and none we didn't. Zero stress on our end. LOVED Love Junkies." "Jon was great to work with and had a good sense of humor. 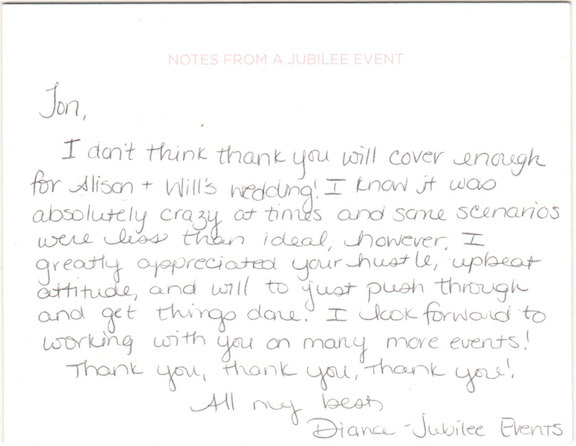 He kept the party energy high during our reception, and we would highly recommend him to another couple looking for a DJ!" "Jon was the perfect DJ for our wedding. He met with us multiple times to get an understanding of who we are and what we wanted, and also brought his own wisdom and knowledge to the equation, leading to an epic and electric 3+ hour dance party. This was confirmed by many of our guests who said it was the best wedding DJing they'd ever witnessed. He clarified every last detail with us and was completely professional. Literally nothing went wrong!" 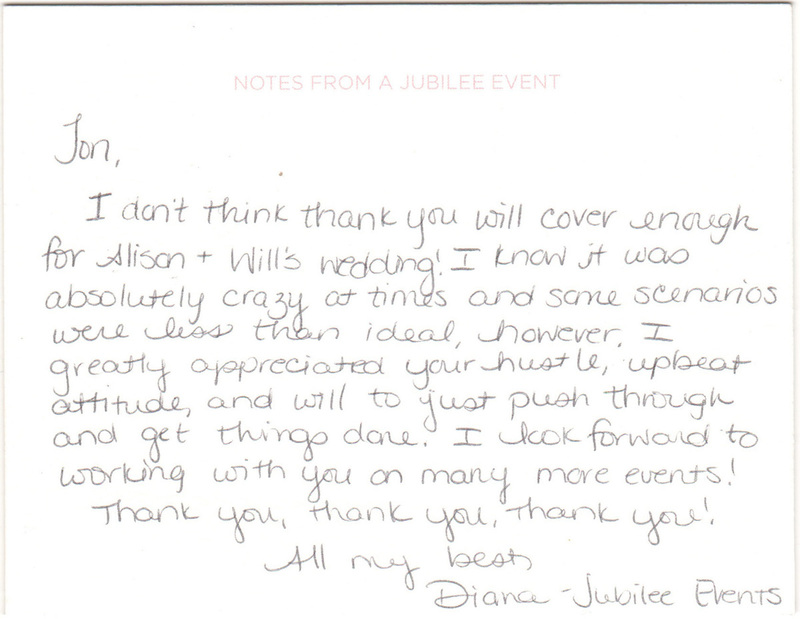 "Jon was patient and professional to a fault, and the perfect wedding DJ. He was the calm rock to our waves of inexperience and neuroses, and brought considerable expertise and experience to help us throw an awesome wedding party for 100 of our closest friends and family. We had rave reviews from everyone...one of my husband's high school friends even said that he had more fun at our wedding than his own. It was such a blessing to have a professional keep us from going off the rails while planning the wedding...He is just the best, top notch person." "We can't say enough good things about Jon! From the moment we reached out to him, he was incredibly helpful and professional and guided us through the entire planning process. His playlist was upbeat and so incredibly fun. Three months later and I'm still getting compliments from guests and family on how great a DJ Jon was. We recommend him to anyone who wants a hassle-free experience with a DJ who knows exactly what he's doing!"